I have said it more than once. I don't make resolutions. I don't like the stress of them, the pressure, the ultimate failure. What I am going to do this year is a word. One word to focus on. One word whose limits I will test. One word that will test my limits. My word for 2011 is COURAGE. Courage can be a big boulder, existing in great tragedy and adversity, this is the courage that we often hear about. But courage can also be a small stone, present in our day to day lives, quiet but strong. This is the courage that I will seek. When the day is black as night and there is nothing there to hold onto. Courage. When the day is sunny and bright, and no one is holding out a great expectation. Courage. Be transparent, even when it is scary. Courage. Reach out to others, even when there is no guarantee they will reach back. Courage. Stand firm, even in the small things. Courage. Give more, even when it isn't certain where the more will come from. Courage. Do the hard things. Courage. Do the easy things...on a hard day. Courage. Get out of bed. Courage. Shut down the negative. Courage. Not only accept change, but embrace it. Courage. Stop old things that worked in the past, but are not working anymore. Courage. Let laughter come easily. Courage. Live big. Love hard. Feel deep. Courage. Don't use phrases like, "I don't do _____" as an excuse to sit on the sidelines, because what that really means is "I'm afraid to do _____, I think I will fail, so I won't even try". Courage. Be the loudest one in the room. Speak. Courage. Be the quietest one in the room. Listen. Courage. Howl at the moon. Courage. Live with arms wide open. Courage. Say yes to myself. Courage. Say yes to God. Courage. Courage doesn't mean that the scary things are no longer scary. Courage means that I do them anyway. What one word would you pick for 2011? If you want to join the community of people living out one word in 2011, visit Alece at Grit and Glory: One Word 2011. A great word. Reminds of the lion from Wizard of Oz. I like the one word theme/mantra. Mine this year is Balance. Love it! I'm going to share your post widely and ask my friends what their word is...I'm sure your courage will inspire us! This was absolutely lovely. I have several friends and family members I want to share this with. And it's my last blog read for the night, and what a nice way to go off to dreamy land. Your courage encourages my fearlessness. Thanks for standing up with me. You have selected such a great word. Love how you described it. The ape is genius. thats amazing i loved this post! i can only take this post one way though. This means you will be vlogging more in 2011 and posting them on your blog. This is an AMAZING post! And I'll join you in seeking, embracing, and practicing COURAGE ... except for that whole "embracing change" thing! Shudder! LOL! I'll have to think of a word for me! I have a harder time with courage than most people think. I guess I'm just good at hiding it. Which, perhaps, is courage of a sort. This is awesome, Tracie! I really smiled in recognition while reading your list. Fantastic post! Thanks for sharing it with us. And I will send courage vibes your way. This is a phenomenal list. It's amazing what all takes courage, isn't it? And all of this does. Okay ... I chose ... http://www.bethszimmerman.com/2011/01/05/one-word-for-2011-trust/ :) Thanks for being an inspiration! Ours are similar! Mine is DARE! I think my word will be ENJOY. Tracie, thanks for sharing your word and what it means for you. I asked myself what my word for 2011 will be and got "Exploration." Now I have to write a post of my own about that which I will link back to here when it is done. What a beautiful and powerful post! I love it! A powerful word Tracie! Blessings. The courage to write, create, and share is a gift to us all. Thank you. My word? Trust. Trust that I will have the strength to help out my family with my mother-in-law's cancer. Trust that I am the best person to parent my children with love. Trust that I am good enough. So beautiful. I thought of the Wizard of Oz Lion, too! Courage goes hand in hand with mine: decisive. "Be transparent, even when it is scary. Courage." This is wonderful. I love the one about being transparent. Well, I love all of them really. 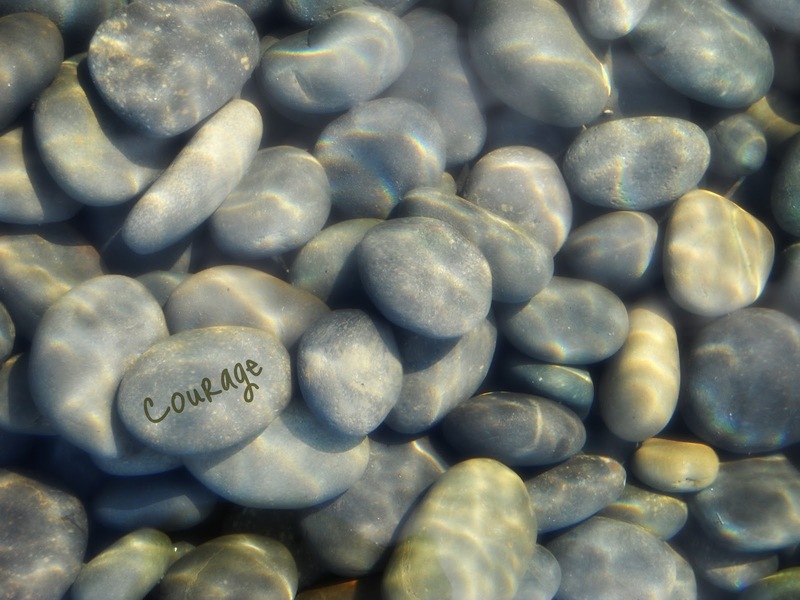 I think I need a little stone that says 'courage' to hold in my pocket as a reminder. I don't know what word I would use. But I'm going to be thinking about it now. Thank you. A great word and an inspiring post. Makes my whiny resolution post look... well, whiny. I'm not sure what word I'd post. I need to think on it! After reading your blog today I thought, here is someone who understands the pain I have been through. Then I saw your "My Name Is" video and realized that it was my daughter's pain you understood. She is 14 and I will have her watch your video. It gives such hope for a life beyond the suffering she has endured. Thank you from the bottom of my heart for making and posting both this blog and your video. a big fat YES to this. Tracie...this was awesome...thank you. I wonder if not liking resolutions is connected to surviving abuse. I know my perfectionism is a result of abuse. I thought I had to be perfect to survive. And the perfectionism is what made me hate resolutions. I also hate doing what everyone else does, so maybe that's it. What a great word!! I love this post!!! such a beautiful post, tracie! love your commitment to focus your heart on courage this year. It's a great word, and you write about it beautifully! what a beautiful word for the year! Can't wait to read more. Thank you for posting the link on your sidebar of your word for 2011. It reminded me of my word, DARE, and in the perfect timing as we are making a traveling decision, and I've known it's the right one, but for many reasons I am terrified. I was set to give my job a two weeks notice today but kept wavering out of fear, and this reminder has made all the difference.